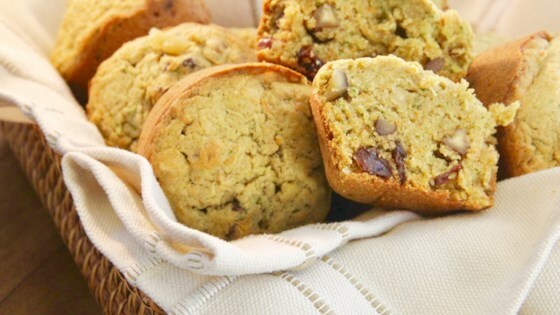 "Scrumptious spiced muffin recipe and a great way to sneak zucchini and carrot into your diet!" Preheat the oven to 350 degrees F (175 degrees C). Grease two 12-cup muffin tins or line cups with paper liners. Combine butter, sugar, and eggs in a large bowl; beat with an electric mixer until creamy. Beat in zucchini, carrots, and vanilla extract. Combine flour, nutmeg, cinnamon, salt, baking soda, and baking powder in a separate bowl. Mix into the creamed butter mixture. Stir in raisins and walnuts. Pour batter into the greased muffin cups. Bake in the preheated oven until a toothpick inserted into the center comes out clean, about 17 minutes. Substitute pumpkin pie spice for the nutmeg if preferred.